Ultrasound scanning via a plaster or catheter: Michiel Pertijs sees real possibilities for reducing the size of ultrasound equipment to millimetre format. And it's all thanks to smart chip technology. Your very first photograph as a baby was probably an ultrasound image. A black and white picture on which, with a little imagination, you can recognise a baby in the womb. Ultrasound scanning is a cost-effective and safe imaging method for viewing inside the body. It is not only suitable for pictures of the unborn child, but for all kinds of organs, as long as they are made of soft tissue. There are good reasons why doctors have long dreamt of probes that are so small that they can enable real-time imaging during minimally-invasive surgery, such as an angioplasty or the replacement of a heart valve. Or how about a wireless incontinence plaster that monitors bladder volume and sets off an alarm when it’s time to urinate? All of this is achievable within the foreseeable future – in around 5 to 10 years, if you ask Michiel Pertijs. Our collaborative partnerships enable us to make more progress towards a medical application. I find that extremely motivating. Ultrasound probes are the old-fashioned analogue telephones. In medical equipment, the digitisation of data is still in its infancy. Ultrasound is known from the animal world: bats also use it. They emit ultrasound that reflects off their prey. That reflection – or echo – returns to the bat after a time. The time between transmitting and receiving is a measure of the distance between the bat and its prey. This principle can be translated to ultrasound scanning: a probe with a sound transmitter and receiver, a transducer, emits ultrasound. When the ultrasound signal hits a surface between two tissues, it reflects back. The transducer receives the echo and transmits it to the ultrasound device, which combines several echoes into an image, for example of a foetus in the womb. An individual echo is comparable to a depth measurement from a boat: if you throw a lead weight on a rope into the water, you know how deep the water is by measuring the length of rope. By doing the same kind of measurement from several boats, you gain an image of the river or seabed. This is similar to a two-dimensional ultrasound image of an object in the body: the boat is the transducer and the rope is the route taken by the sound. 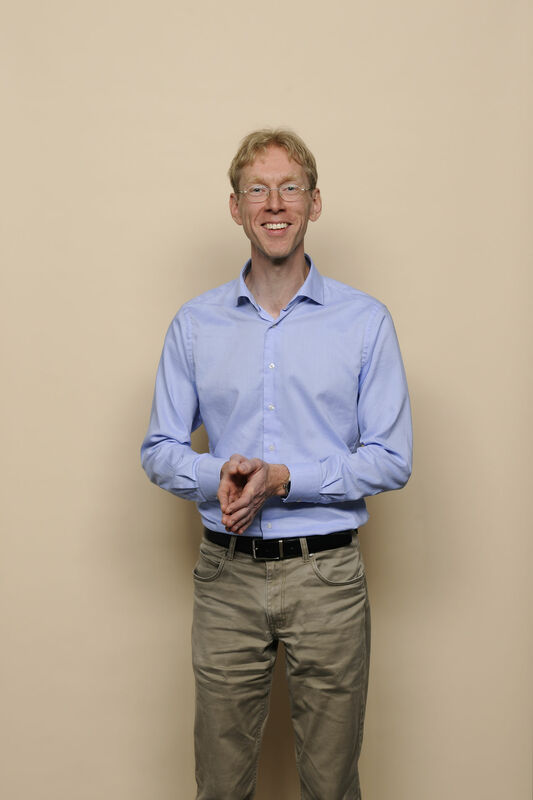 Michiel Pertijs is associate professor in the Electronic Instrumentation Lab in TU Delft’s Microelectronics department. He studied Electrical Engineering at TU Delft and obtained his doctorate in smart temperature sensors. He then became a product designer at the chip company National Semiconductor and a senior researcher at the Holst Centre in Eindhoven. After returning to research, he had the opportunity of a position as associate professor back at TU Delft. In it, he combines his expertise as a chip designer with ultrasound research.